Participation is recognized as an important contribution to implementing the right to health. It features as a key element of the global movement to achieve universal health coverage. The mobilization of groups into collective action is central in this. In South Africa, universal health coverage has become a feature of health policies, with the country’s new National Health Insurance (NHI) scheme in the process of being established. The NHI is considered an experiment in social solidarity. This paper provides insights into civil society’s experiences in the pursuit of universal health coverage via the implementation of the NHI. It explores the interplay of trust, reciprocity, and altruism and how these individual actions can advance toward solidarity and collective action. Our research shows that the road to universal health coverage via the rollout of the NHI will be complex. However, opportunities for collective action exist, including shared learning about human rights, as well as local initiatives within trusted circles. A collective health commitment is based on trust between the government and citizens. Thus, one of the first steps in implementing the NHI should focus on rebuilding trust, which could be developed by establishing platforms for citizen participation. Key to achieving universal health care is a rights-based approach to health that integrates human rights norms in health policies and programs and that includes individual and collective action. Such an approach embraces the principles of equity, equality, dignity, and non-discrimination and is applied to both the determinants of health and health care provision. It means empowering society—particularly through awareness of citizens’ right to voice their needs—to hold the government accountable for the provision of health care. A rights-based approach to health acknowledges the voice of the most vulnerable individuals in society and provides them with the opportunity to address human rights violations in health care provision. An important component of this rights-based approach is the mobilization of groups for collective action to pressure governments to realize the right to health. Such collective action is dependent on citizens being aware of their rights and being willing and able to hold duty bearers accountable. A well-known example of collective action is the Treatment Action Campaign, whose campaigning, mobilization, and legal strategies ultimately led to the achievement of universal access to antiretroviral therapy for HIV/AIDS in South Africa. This campaign was driven by a strong civil society movement that aimed its collective action at national and international policies, demonstrating that collective action can thus contribute to shaping responsive state policies. Civil society and community groups can pursue shared objectives for the realization of the right to health that provide a more powerful base than individual claims. Although many view the right to health as individualistic in nature, Leslie London et al. (2014) argue that the right to health can actually be delivered to collectives, for public health policy interventions apply to communities and groups as well as individuals. Rights claims that are framed collectively will therefore benefit society as a whole. In this way, solidarity emerges as a key concept. Social solidarity emphasizes the interdependence between individuals in a society, which allows individuals to feel that they can enhance the lives of others. It is a core principle of collective action and is founded on shared values and beliefs among different groups in society. Social solidarity has been deemed essential to the realization of rights. South Africa is a country where evolving social policy demonstrates the importance of social solidarity to human rights approaches. Following decades of colonial rule and apartheid characterized by systematic human rights violations, a new bill of rights was adopted in 1996 as part of the country’s new constitution. Section 27 of the Constitution notes that “[e]veryone has the right to have access to health care services, including reproductive health care, sufficient food and water, and social security, including, if they are unable to support themselves and their dependents, appropriate social assistance.” However, despite the promise of the Constitution and the passing of many years of democracy, widespread knowledge of the right to health remains lacking, inequalities in health status and the distribution of resources persist, and the practical realization of the right to health remains a challenge. In South Africa, reforming the health system has been a priority. The pursuance of universal health care has become a feature of recent health policies, particularly in arguments for the introduction of a National Health Insurance (NHI) scheme, which is currently in the process of being established. With the implementation of the NHI, the South African government aims to move toward universal health coverage via improved access to and provision of quality and equitable health services, which can be seen as a step forward in achieving the right to health. Although the right to health has been part of the Constitution for over 20 years, and transformation of the country’s health system to achieve equity in health was first mooted in a 1997 white paper, the practical implementation of steps to achieve equity and universal access has been uneven and incomplete. Seeking to fill this gap, a series of NHI green and white papers have been issued in recent years to accelerate policy intent. To achieve universal health coverage, the NHI must rely in some measure on people’s willingness to accept risk- and income-related cross-subsidies, which renders its implementation an experiment in social solidarity. Social solidarity is an important foundation of equitable health care systems whereby everyone is willing to pay for health care according to their means and everyone benefits according to their needs. The success of the NHI depends largely on the willingness of South Africans to see health care within the framework of social solidarity, in which health care is treated as a collective construction rather than an individualist one. Hence, collective progressive payments into a NHI fund can be seen as a form of solidarity and the collective understanding of health en route toward universal health care. Francesco Paolucci suggests that health care may be more likely to attract actions of social solidarity because people would, for a range of reasons, be willing to pay for the consumption by others of goods and services related to health and health care. This paper explores the views and experiences of members of health civil society groups in relation to social solidarity and collective action. Concepts closely related to social solidarity are trust, reciprocity, and altruism. Although these concepts are instituted as individual acts, the outcomes can contribute to enhancing social solidarity and collective action. Our research aim was to explore the interplay of trust, reciprocity, and altruism and how these individual actions can advance solidarity and collective action within a rights-based framework. The experiences of civil society participants may provide insight regarding how to apply the concepts of solidarity and associated individual acts for collective action to the implementation of the NHI, so as to advance universal health care as an expression of the right to health. We adopted a conceptual framework (see Figure 1) based on Robert Campbell et al. to explore social solidarity and collective action needed for the implementation of the NHI. 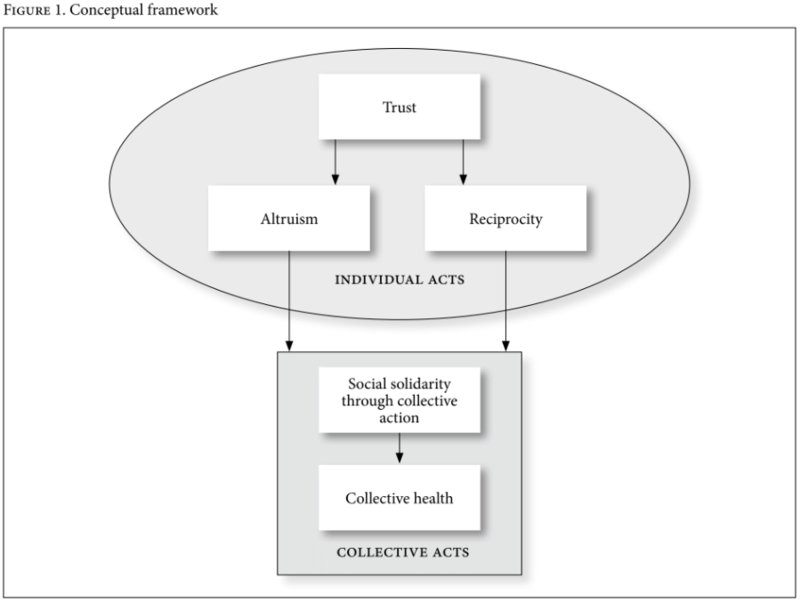 The framework is divided into individual actions (concerning actions related to trust, altruism, and reciprocity) and collective actions (concerning actions such as social solidarity). The framework was used as a tool for the exploration of individual acts in order to reflect on or predict what could happen in a collective situation, such as social solidarity in support of the NHI. For the purposes of this paper, collective action is defined as the behavior and actions of a group working toward a common goal, which, in this case, is the achievement of collective health as the practical utilization of universal health care through the implementation of the NHI. Solidarity is an element of human association that emphasizes the cohesive social bond that holds a group together, which is valued and understood by all group members. There are different motives for solidarity. For some, affection and shared norms and beliefs are motives, while for others, rational choice and self-interest are drivers. The concepts of trust, altruism, and reciprocity are grouped under individual acts, as they are instituted from an individual standpoint. Trust is a relational concept that can be instituted between two individuals or between an individual and an organization. A common understanding of trust is “voluntary action based on expectations of how others will behave in the future in relation to yourself.” This concept has been widely recognized as enhancing cooperation between individuals and groups and ensuring that economies and nations thrive. Trust and shared values can increase feelings of self-esteem and security within and between communities, and they can provide a basis for achieving collective goals. Trust is important to a strong health care system, since such a system requires cooperation and shared values within society. Trust in someone is based on reputation, former experiences, background, culture, and social class. Trust becomes weaker when social distance increases, as the expectations of strangers are unknown. Trust is higher among friends than strangers. Altruism refers to behavior that reflects an unselfish desire to live for others. Altruism is considered to be the opposite of selfishness and involves placing what is good for others above what is good for oneself. It comprises a moral obligation to sacrifice oneself—or time, energy, or possessions—for the collective good. Pure altruism contains no expectation of receiving something in return. Altruistic behavior is voluntarily and intentionally performed. Émile Durkheim argued that altruism and shared values should lie at the base of social solidarity to avoid selfish behavior; he argued that individuals should consider not only their own interests but also their duties to the community. Altruism needs a base of trust before being instituted. Reciprocity is assistance to an individual or a group provided by another individual or group under the assumption that the favor may be returned in the future. The concept differs from altruism in that reciprocal action comprises expectations of future rewards, whereas altruism does not have these expectations. Reciprocity is a strong determinant of behavior and contributes to equal relationships. It can produce an obligation to return the favor in the future, which enhances continued relationship. An act of an individual in a reciprocal system is a combination of “short-term altruism” and “long-term self-interest.” Reciprocal behavior comprises a willingness to contribute to the collective good and to reprimand those who refrain from contributing. Reciprocity promotes solidarity and shared interests by fostering repeated interactions among community members—hence, a two-way arrow is placed in the framework in Figure 1. Reciprocity has been used to explain the continuation of collective action in situations where instant incentives are absent. We conducted our research in the Western Cape Province of South Africa from March to July 2012. This province is characterized by substantial inequalities in income, housing, education, and access to health services. Our research was undertaken as part of the Learning Network for Health and Human Rights, a collaborative program that, at the time, involved six civil society organizations (CSOs) and three universities working toward good practice in realizing the right to health. The Learning Network uses reflective activities to explore how collective action can identify good practice with regard to using human rights to advance health. Member organizations include constituency-based CSOs and service- and advocacy-oriented nongovernmental organizations addressing both health and the social determinants of health. We undertook a qualitative mixed-method exploratory study that relied on five focus groups, one semi-structured interview, and observations (see Table 1). Purposive sampling was used to identify members of the CSOs in the Learning Network. Through CSO contacts, we arranged focus groups comprising mixed-gender groups of 5–12 adults (over 18 years old) per group. The participants came from historically disadvantaged socioeconomic backgrounds. Participants’ informed consent was obtained. The focus groups were conducted in English, with Afrikaans translation into English provided during the sessions by a trained interpreter. All focus groups and interviews were voice recorded. Transcripts were anonymized, and pseudonyms are used in this paper. Approval was obtained from the Human Subjects Research Ethics Committee in the Health Sciences Faculty, University of Cape Town (HERC REF:146/2012). To start each focus group discussion, we used a vignette from a DVD entitled Law and Freedom concerning post-apartheid South Africa. In the excerpt, pensioners who had been denied access to social security in 1998 by the Eastern Cape government in an attempt to root out corruption in pension claims went to court to seek restoration of their benefits. One pensioner, Ms. Meltafa, was the first litigant in this class action against the government. She was offered a direct settlement by government officials. Despite her financial distress, she decided to persist with the claim, reasoning that others could benefit if the case was successful. Her rights claim can be understood from a more collective notion than can most court actions. Participants of the focus group were asked to reflect on the ideas generated by the vignette and to share their ideas on the elements necessary for collective action. The concepts of trust, reciprocity, and altruism were discussed separately, and participants were asked to give examples of these concepts as they relate to health or collective action. We undertook a thematic analysis using inductive and deductive reasoning to identify broad themes. We used the conceptual framework outlined in Figure 1 as a tool for reflection. After first-order coding, we performed advanced coding, which facilitated a higher level of abstraction and a categorization of the data. We summarized the codes into matrices that clearly displayed the data. We analyzed the results in terms of the concepts of trust, altruism, and reciprocity and how these concepts evolve from individual approaches to collective actions. We explored the notion of trust by asking whether people can rely on one another. Participants said that different communities cannot rely on one another because “people are coming from different backgrounds” (FDG2, woman 1). Participants defined the notion of community as “the people you live within a particular area, with its own structures and group norms” (interview, man L). The main reason put forward for this lack of trust was the fact that, nowadays, everyone looks out only for themselves. One of the participants (interview, man L) referred to the fact that strong ties in society used to come from the action of Ubuntu (a traditional African worldview in which a person exists because of and through relationships with other people). However, this feeling has been eroded by modern urban culture, which encourages individuals to act for themselves. This lack of trust in others could pose a threat to cohesive bonds, as, according to Mark Smith, nations thrive when trust and social networks are strong. Similar to Christine Binzel and Dietmar Fehr’s findings, we found that trust was lower among strangers: “The time when not anyone could come this way, to this country, there is no drugs. With only South Africans, we have no idea for the drugs. The time when we had freedom, every people could come here, and now there is so many drugs” (FGD1, woman 8). These comments imply that illicit drug use is the fault of foreign nationals entering post-apartheid South Africa in an uncontrolled manner, a sentiment not uncommon among socioeconomically disadvantaged communities in South Africa. The government in particular—including state institutions and political spaces in general—was seen as untrustworthy: “People lost hope, people haven’t got confidence in the government anymore. Our people say no to politics, our people don’t want politics” (FGD1, woman 3). According to participants, promises of jobs, a good health system, and education are not delivered. Corruption was mentioned as an important factor for this lack of trust. Furthermore, trust inspired by the installation of a democratic post-apartheid government has faded away “because we fought for this freedom. And we used to trust them. I think the main problem is also [that] the system is very much [home] to the criminals now” (FGD1, woman 6). Individuals’ lack of trust in one another, in strangers, and in the government may reduce their willingness to unite in collective action, as people may not feel empowered enough to assert their rights or trust that their claims will be taken seriously. Furthermore, it may affect individuals’ willingness to go beyond their small group of kin and act on behalf of the greater good. Applying this panorama to the implementation of the NHI, it can be argued that a solid base is missing, for trust is the first step toward social solidarity and collective action. If people do not trust that their contribution to the NHI will benefit themselves and others, it may be hard to foster a willingness to pay. We explored the concept of altruism by asking participants if they would help someone without expecting a favor in return. Some said that doing favors arises from care for others: “You must do it out of your heart, not to expect anything back from that person” (FGD4, man E). The participants provided an example of altruism in which a community helped a woman whose house burned down by providing her with clothes and food. This example prompted several reactions: “My opinion is that it does not always happen like that in our communities. But if our community or our people could do the same thing … it would help a lot for people who are being treated out of their rights” (FGD2, woman 1). The respondent thus both dismissed the example as representing what happens in reality but also acknowledged that it should happen because solidarity is important for realizing human rights. Although participants shared a positive view on altruism, they agreed that this was not the norm and that most people just look out for themselves. One example they offered was that of elected local ward counselors who use their political power to provide favors to family members instead of helping the community. As one participant explained, only a small number of people do things to benefit the whole community: “It would be people that are passionate about the community, that are passionate about whichever group or community they are helping … but very few [are]” (FGD2, woman 5). A similar opinion was voiced by another participant: “There are people that [do things for the community]. But there are others that will do something for you, but then you are on the owe-list” (FGD3, woman C). An “owe-list” implies that the person performing the favor will eventually ask for a settlement of the “debts” when convenient, which is similar to reciprocity. Participants’ comments showed that they felt they owed something to the community but did not have enough resources or power to make a difference. They recognized the importance of enabling others to claim their rights, as in the video vignette. After watching the video, one woman said, “You can stand up for other people. Because they don’t know what is going on” (FGD1, woman 6). Sharing knowledge about human rights, health claims, and institutions was mentioned by participants as a simple option that does not require many resources. This represents an opportunity in which altruism can lead toward social solidarity, as shared learning is often a first step toward collective action. However, participants believed that people are generally unwilling to sacrifice money for others since most people have their own financial problems to worry about. Instead, people want to receive something in return, as this quotation illustrates: “Maybe if they give money away for the sake of giving, there must always be what is the purpose of this money, what am I getting out of this at the end of the day” (FGD3, woman C). The evidence gathered through our research confirms the relationship between trust and altruism in the framework outlined in Figure 1. Similar to the concept of trust, altruism is unlikely to be established between strangers or with individuals outside one’s community. Community members are more likely to be altruistic when it comes to their fellow members: “In a big society, people are more likely to look out for themselves but within family circles they tend to look after each other” (interview, man L). It can be argued that there is a small possibility that solidarity will arise from altruism. However, this will occur only within small communities where a strong base of trust is present. This collective action is unlikely to involve material or financial goods but rather intangible goods such as advice or shared learning. We explored the concept of reciprocity by examining participants’ willingness to return favors, as well as their reasons for this willingness or lack thereof. Participants described exchanging favors as “a way of getting in another one’s good book” (FGD3, woman C) and as a means “to be favored yourself” (FGD3, woman N). Their responses suggested that self-interest is an important driver for favors: “You might have something extra that you might not need now and you can translate it into something that you might benefit from later” (interview, man L). Another participant mentioned that doing good is easier when one knows that the result is positive: “It’s almost like the effort equals the benefit” (FDG2, woman 3). Although Aafke Komter has suggested that self-interest can be a motive for solidarity, it became clear from our research that self-interest must be accompanied by feelings of affection and trust in order for this to be true. Self-interest alone may not persuade more advantaged individuals to contribute to an NHI scheme knowing that the needs of the less advantaged are larger than their own benefits. Jane Goudge et al. argue that in cases such as this, solidarity becomes less of a motivation for decisions than self-interest. However, if self-interest is combined with feelings of trust or altruism, it may become a driver toward collective action. Receiving a favor leaves one feeling obliged to return it, which enhances a bond between individuals and provides a feeling of a collective goal: “What you benefit at the end of the day, you have to make sure that you are ploughing back for other people who are poor … more than you … Even [if] you do not pay back by money, then you do some other things in the other community” (FGD2, man 4). One of the participants added that time plays a role: “You might help somebody now, but you might need to wait for a long time to get the benefits” (interview, man L). An example illustrating this is when families save money to send their children to university, expecting that these children, after graduating, will be able to support the whole family. Contributions to the NHI could be framed on a similar note: you might not need benefits today, but you might need them later in case of sickness. Participants revealed a strong distinction between a willingness to reciprocate within trusted circles and a willingness to reciprocate with strangers outside one’s community. Reciprocal acts or bonds were found to be more established within families and groups of close friends. Marshall Sahlins distinguishes generalized from balanced reciprocity by describing generalized reciprocity as instituted between individuals who are kin and who feel a weak obligation to reciprocate in a short time frame. Meanwhile, balanced reciprocity requires the direct and immediate exchange of a favor of the same value. The results from our focus groups suggest that relationships based on balanced reciprocity are present. However, for such reciprocity to be established, a base of trust is needed. If trust is missing, the willingness to reciprocate favors diminishes, as can be seen in this quotation: “I’m sorry to say to you, if it is somebody who was in the government. I can’t make any favor for him, because they did not make any favor for us” (FGD1, woman 11). According to Durkheim, interdependence between individuals forms the basis of social solidarity. Along these lines, our focus groups aimed to identify examples of social bonds and shared values. Participants acknowledged the importance of collective action: “If we can work together, all of us, South Africa would be beautiful. Nobody gets crime, nobody can sleep in the street, nobody can smoke the Dagga [marijuana] and taking the tik [methamphetamine]” (FGD1, woman 1). One example of social solidarity recounted by participants was a case of patients’ rights violations in which a health clinic had different queues for HIV and tuberculosis patients, which exposed HIV/AIDS patients to stigma. Community members took the issue to the clinic manager, after which the queues were merged and the signs removed. Relating the case of Ms. Meltafa to contributions to the NHI, one could argue that the aspect of solidarity lies in the contribution to the collective, as can be seen in the health clinic case, and the benefit from added protection via the NHI. In Ms. Meltafa’s case, she contributed her time and resources, and she risked losing the government grant. A contribution to the NHI could be seen as a similar act for the larger society. However, participants lamented that examples of solidarity actions are not common in practice: “Solidarity is lacking very, very much” (FGD2, woman 2). Participants described collective action as a commitment to society as a whole, like that of Ms. Meltafa, who did not accept the settlement and instead continued to fight so that everyone could benefit. They considered collective action important but difficult to achieve, as noted by one participant: “It is about collective action at the end of the day, but how do you get people to realize that collective action would work?” (FGD2, woman 2). Participants argued that collective action can be undermined by individualism: “There are people that do things to help the community as a whole. But that is also a struggle, because … there is always one that is turning away” (FGD3, woman C). Another participant stated, “It depends on how bad they want the situation to change. So people will stay united for a special purpose, and then when it is fulfilled, they disperse” (FGD2, woman 3). Given that contributions to the NHI will be continuous, this lack of long-term commitment may be problematic. Solidarity is a shared recognition of a common good that holds a group together. Nevertheless, participants saw South African society not as a group with common goals and shared values but rather as a divided society: “We’ve got a divided community that is a fact and that is the truth” (FGD4, woman M). South Africa needs a new feeling of “mutual compassion” that will bring people together. Chuma Himonga extends this by noting that the concept of Ubuntu could serve this role, as its attributes such as interdependence and community orientation possess the ability to advance the right to health. An opportunity for collective action could be thought to be represented by voting in elections for local political leaders. However, participants dismissed this form of representative democracy as a meaningful channel for realizing rights claims, feeling that their vote was unlikely to make a difference. Moreover, they expressed being afraid of claiming their rights in government institutions since they feared they might be shouted at or sent away. One participant who is a social worker indicated that people are aware of their rights and empowered to claim them but are discouraged from doing so: “They don’t see any action so they just see that as something that’s put on the wall to look pretty” (FGD2, woman 5). Furthermore, participants suggested that people are passive about claiming their rights: “So it’s almost like they are sitting back, thinking, I have my rights. So one day it will come to me” (FGD2, woman 2). Additionally, it was mentioned that “civil society is not an accepted place to be in nowadays as collectively organized meetings are seen as trouble making” (interview, man L). Maria Stuttaford et al. outline the importance of ensuring that spaces where people can go to claim their rights are acceptable and appropriate. If this is not the case, people may shy away from expressing their needs. Ways for communities to influence decision making in the NHI will be critical if collective action is expected to help generate social solidarity for the NHI. Participants mentioned various ideas regarding the necessary elements for engaging in collective action. One idea was that community members should engage in government institutions and serve on boards responsible for decision making. Another idea was that shared learning was important for the collective, since communities experience similar issues: “We need to network with others, we need to invite them to come and maybe strengthen us, to empower us” (FGD4, woman M). We recognize that this study did not include the voices of the economically wealthier. For future research efforts, it would be important to explore the social solidarity and collective action framework with diverse populations in order to offer broader insights into how health goals related to universal health care can be reconciled with rights claims to health in a future NHI in South Africa. Our research findings suggest that the road to achieving the right to health and universal health care via the implementation of the NHI will be complex. We applied a framework linking social solidarity and collective action to participants’ views in order to predict if and how social solidarity could both contribute to and be generated in the establishment and implementation of the NHI. Our findings suggest that collective action and solidarity are valued but are considered to function only in the context of small-scale trusted circles. The key question remains how this solidarity and collective action can be expanded for NHI implementation. Experiences from the Learning Network for Health and Human Rights provide insights regarding opportunities for collective action by showing that small-scale individual acts such as shared learning about health and human rights or local initiatives can work toward the collective good. The exploration of reciprocity showed a key opportunity for collective action by acknowledging self-interest as a driver. User payments to the NHI can be framed as individual acts toward collective health, and the expectation of benefits for oneself can form a basis for collective action if combined with the existence of altruism and certainty of future rewards. This relates to the willingness to cross-subsidize those who are worse off or sicker than oneself. For such willingness to exist, trust in the return on “investment”, in case one falls ill, needs to be present. Our findings also point to certain areas that require strengthening in order for the NHI to succeed. A basis of trust should be established between the government and South African society. Given our findings and those of other studies showing that the public’s trust in the South African government is low, a first step in the implementation of the NHI should focus on rebuilding trust. Part of this effort could include the establishment of platforms for collective action and citizen participation. There should be a shared recognition and acceptance of the importance of civil society action and collective action between the government and communities. However, there are concerns about the exclusion of civil society in the establishment of the NHI. The NHI could be an opportunity to strengthen bonds between the state and citizens given that it builds on the willingness of citizens to pay for the worse off. However, the creation of a progressive financing system in and of itself does not guarantee this willingness. If the government can reestablish a basis of trust and acceptance among civil society, there might be an opportunity for South Africans to benefit from the solidarity and collective health that the NHI envisages. Renate Douwes, MSc, is an honorary research associate at the University of Cape Town, South Africa, and currently works for Simavi, a Dutch nongovernmental organization in the field of sexual and reproductive health and rights. Maria Stuttaford, PhD, is an honorary senior lecturer at the School of Public Health and Family Medicine, University of Cape Town, South Africa. Leslie London, MD, is a professor of public health and family medicine at the University of Cape Town, South Africa. Please address correspondence to Renate Douwes. Email: renate.douwes@simavi.nl. Copyright © 2018 Douwes, Stuttaford, and London. This is an open access article distributed under the terms of the Creative Commons Attribution Non-Commercial License (http://creativecommons.org/licenses/by-nc/3.0/), which permits unrestricted non-commercial use, distribution, and reproduction in any medium, provided the original author and source are credited.
. P. Hunt and G. Backman, “Health systems and the right to the highest attainable standard of Health” Health and Human Rights Journal 10/1 (2008), pp. 81–92.
. G. Ooms, A. Latif, A. Waris, et al., “Is universal health coverage the practical expression of the right to health care?,” BMC International Health and Human Rights 14/1 (2014); A. Chapman, “The contributions of human rights to universal health coverage,” Health and Human Rights Journal 18/2 (2016), pp. 1–5.
. Universal Declaration of Human Rights, G.A. Res. 217A (III) (1948), art. 25. (2002), p. 1880; L. London, C. Himonga, N. Fick, and M. Stuttaford, “Social solidarity and the right to health: Essential elements for people-centred health systems” Health Policy and Planning 14/1 (2014), pp. 1–8.
. A. E. Yamin, “Shades of dignity: Exploring the demands of equality in applying human rights frameworks to health,” Health and Human Rights Journal 11/2 (2009), pp. 1–18.
. L. London, “What is a human-rights based approach to health and does it matter?,” Health and Human Rights Journal 10/1 (2008), pp. 65–80.
. Chapman (see note 2).
. S. Friedman and S. Mottiar, “A rewarding engagement? The Treatment Action Campaign and the politics of HIV/AIDS,” Politics and Society 33/4 (2005), pp. 511–565; N. Geffen, Debunking delusions: The inside story of the TAC (Auckland Park: Jacana Media, 2010); M. Heywood, “Preventing mother-to-child HIV transmission in South Africa: Background, strategies and outcomes of the Treatment Action Campaign case against the Minister of Health,” South African Journal on Human Rights 19 (2003), pp. 278–315.
. Hunt and Backman (see note 1); London (see note 7), pp. 65–80.
. London et al. (2014, see note 5).
. E. Durkheim, The division of labor in society: A study of the organization of higher societies (Paris: Les Presses Universitaires de France, 1893).
. Ibid. ; C. Himonga, M. Taylor, and A. Pope, “Reflections on judicial views of Ubuntu,” Potchefstroomse Elektroniese Regsblad 16/5 (2013), pp. 1–61.
. S. Marks, “Emerging human rights: A new generation for the 1980s?,” Rutgers Law Review 33 (1981), pp. 435–452.
. Constitution of the Republic of South Africa (1996), sec. 27.
. J. Mubangizi and B. Mubangizi, “Poverty, human rights law and socio-economic realities in South Africa,” Development Southern Africa 22/2 (2005), pp. 277–290; L. London, N. Fick, K. Tram, and M. Stuttaford, “Filling the gap: A learning network for health and human rights in the Western Cape, South Africa,” Health and Human Rights Journal 14/1 (2012), pp. 1–18.
. A. Fusheini and J. Eyles, “Achieving universal health coverage in South Africa through a district health system approach: Conflicting ideologies of health care provision,” BMC Health Services Research 16/1 (2016), p. 558; Y. Pillay and P. Barron, “Progress towards the millennium development goals in SA,” South African Medical Journal 104/3 (2014), p. 223.
. Fusheini and Eyles (see note 20).
. B. Mayosi, J. Lawn, A. van Niekerk, et al., “Health in South Africa: Changes and challenges since 2009,” Lancet 380/9858 (2012), pp. 2029–2043; Committee on Economic, Social and Cultural Rights, Initial reports of States parties due in 2017: South Africa, UN Doc. E/C.12/ZAF/1 (2017).
. D. McIntyre, J. Goudge, B. Harris, et al., “Prerequisites for national health insurance in South Africa: Results of a national household survey,” South African Medical Journal (2009), pp. 725–729.
. B. Harris, N. Nxumalo, J. Ataguba, et al., “Social solidarity and civil servants’ willingness for financial cross-subsidization in South-Africa: Implications for health financing reform,” Journal of Public Health Policy 32/Suppl 1 (2012), pp. 162–183.
. Goudge et al. (see note 23).
. F. Paolucci, “Health care financing and insurance: Options for design,” Developments in Health Economics and Public Policy 10 (2011), pp. 1–114.
. A. Komter, Solidariteit en de gift (Amsterdam: Amsterdam University Press, 2003); M. Woolcock and D. Narayan, “Social capital: Implications for development theory, research, and policy,” World Bank Research Observer 15/2 (2002), pp. 225–249.
. R. Campbell, “Altruism in Auguste Comte and Ayn Rand,” Journal of Ayn Rand Studies 7/2 (2006), pp. 357–369; L. Gilson, “Trust and the development of health care as a social institution,” Social Science and Medicine 56/7 (2003), pp. 1453–1468; Komter (see note 28); W. Rehg, “Solidarity and the common good: An analytic framework,” Journal of Social Philosophy 38/1 (2007), pp. 7–21; R. Putnam, “The prosperous community,” American Prospect 4/13 (1993), pp. 35–42.
. G. Marshall, A dictionary of sociology (New York: Oxford University Press, 1998).
. Rehg (see note 29).
. Komter (see note 28).
. Gilson (see note 29).
. J. Berg, J. Dickhaut, and K. McCabe, “Trust, reciprocity, and social history,” Games and economic behavior 10/1 (1995), pp. 122–142; M. Smith, Social capital, the encyclopaedia of informal education. Available at http://infed.org/mobi/social-capital/.
. N. Luhmann and N. Familiarity, “Confidence, trust: Problems and alternatives,” in Gambetta, Diego Trust: Making and Breaking Cooperative Relations (Oxford: Department of Sociology, 2000), pp. 94–107.
. E. Glaeser, D. Laibson, J. Scheinkman, and C. Soutter, What is social capital? The determinants of trust and trustworthiness (National Bureau of Economic Research, No. w7216, 1999).
. C. Binzel and D. Fehr, “Social distance and trust: Experimental evidence from a slum in Cairo,” Journal of Development Economics 103 (2013), pp. 99–106.
. A. Comte, System of positive polity, volume 1: Containing the general view of positivism and introductory principles, John Henry Bridges (trans) (New York: Burt Franklin, 1973).
. Campbell (see note 29).
. D. Batson and L. Shaw, “Evidence for altruism: Towards a pluralism of prosocial motives,” Psychological Inquiry 2/2 (1991), pp. 107–122.
. J. Piliavin and C. Hong-Wen, “Altruism: A review of recent theory and research,” Annual Review of Sociology 16/1 (1990), pp. 27–65.
. Durkheim (see note 15).
. E. Uslaner, “Democracy and social capital,” in M. Warren (ed), Democracy and trust (Cambridge: Cambridge University Press, 1999).
. Putnam (see note 29).
. R. Cialdini, M. Schaller, D. Houlihan, et al., “Empathy-based helping: Is it selflessly or selfishly motivated?,” Journal of Personality and Social Psychology 52/4 (1987), pp. 749–758.
. A. Falk and U. Fischbacher, “A theory of reciprocity,” Games and Economic Behavior 54/2 (2006), pp. 293–315.
. S. Bowles and H. Gintis, “The evolutionary basis of collective action,” (Santa Fe Institute working paper, 2004).
. E. Hoffman, K. McCabe, and V. Smith, “Behavioral foundations of reciprocity: Experimental economics and evolutionary psychology,” Economic Inquiry 36/3 (1998), pp. 335–352.
. W. Smit, A. de Lannoy, R. Dover, et al., “Making unhealthy places: The built environment and non-communicable diseases in Khayelitsha, Cape Town,” Health and Place 35 (2015), pp. 11–18.
. London et al. (2012, see note 19).
. Learning Network for Health and Human Rights, Learning Network. Available at http://salearningnetwork.weebly.com/.
. Community Media Trust, The case of Nobulelo Meltafa. Available at http://www.beatit.co.za/archive-people/nozozile-and-nobulelo-meltafa.
. V. Braun and V. Clarke, “Using thematic analysis in psychology,” Qualitative Research in Psychology 3/2 (2006), pp. 77–101.
. M. Miles and A. Huberman,” Qualitative data analysis (Newbury Park, CA: Sage, 1985).
. Himonga (2013, see note 16).
. Smith (see note 35).
. Binzel and Fehr (see note 40).
. P. Tatenda Makanga, N. Schuurman, and E. Randall, “Community perceptions of risk factors for interpersonal violence in townships in Cape Town, South Africa: A focus group study,” Global Public Health 12/10 (2015), pp. 1254–1268.
. M. Sahlins, “On the sociology of primitive exchange,” in M. Banton (ed), The relevance of models for social anthropology (1965), p. 236.
. M. Rapatsa, “Transformative constitutionalism in South Africa: 20 years of democracy,” Mediterranean Journal of Social Sciences 5/27 (2014), p. 887.
. C. Himonga, “The right to health in an African cultural context: The role of ubuntu in the realization of the right to health with special reference to South Africa,” Journal of African Law 57/2 (2013), pp. 165–197.
. M. Stuttaford, D. Kiewiets, W. Nefdt, et al., “Conceptualising implementation of the right to health: The Learning Network for Health and Human Rights, Western Cape, South Africa,” in M. Freeman, S. Hawkes, and B. Bennett (eds), Law and global health: Current legal issues, Volume 16 (Oxford: Oxford University Press, 2014), pp. 76–93.
. R. Mattes, “South Africa: Democracy without the people?,” Journal of Democracy 13/1 (2002), pp. 22–36.
. A. Padarath, D. Sanders, L. London, et al., “Community participation in the post-apartheid era: Progress and challenges,” in R. Fryatt, G. Andrews, and M. Matsoso (eds), South Africa health reforms 2009–2014: Moving towards universal coverage (Cape Town: Juta, 2015).
. L. Reynolds, “Has the National Health Insurance process been captured?,” Daily Maverick (August 28, 2017). Available at https://www.dailymaverick.co.za/article/2017-08-28-op-ed-has-the-national-health-insurance-process-been-captured.
. Harris et al. (see note 25).